September 24 marks the birthday of one of Kingston’s notables, Helen Foster. 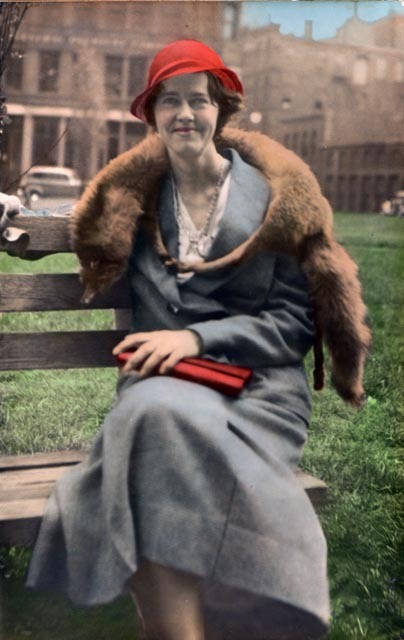 Born in 1900, she studied art extensively and eventually became the first female commercial artist in Boston. She lent her talents to her hometown, designing the town seal and town quilt, collaborating on the town flag, and serving on the Council on Aging. For more on Helen’s life, click here for the biography written for the Kingston Arts Festival “Past Masters” exhibit, which featured Helen’s work. She was very deep, an exceptional woman. Her description of the world she saw is an explosion of detail and color. I can see from just her words the fields of her childhood, every flower, tree and rock. When she writes about the spontaneous parade she saw at the end of World War I, the soldiers march off the pages and the flags fly high. I am always moved by her words. What an amazing, talented artist. This kind of connection — getting to know someone you never had the chance to meet in real life — is one of the special things about a local history collection as rich as ours. The first day of school in 1909 found some Kingston children attending the newest school in town, the Maple Avenue School. It was a two room building, planned so that another room could be added if necessary, and it was the most modern and hygienic schoolhouse to be had. Students entered through a porch which afforded protection in stormy weather, and studied in two well-lighted and ventilated classrooms. A teacher’s room and coat room were also included. The classrooms were arranged so that one teacher could oversee both as well as the entrances to the two playrooms in the basement. The latter were light and airy, with a toilet approved for schoolhouse use. Except for the blackboard ledges, there were no projecting surfaces to catch and hold dust and germs; there were no thresholds to stumble over. The coat- and hat-racks were carefully arranged so each individual garment touched neither the wall nor its neighbors. Land for the school had been purchased for $500 from Albert E. Holmes, partitioned from the rear of his lot on Main Street. The school was built by George B. Holmes, who five years later built the Cobb School in Rocky Nook. Construction costs totaled $8,618, somewhat more than expected but the town was for the most part pleased with the new facility. On opening day, four grades were taught by two teachers, Annie Fales and Stella Baker. There was no gymnasium, no lunch room, and storage space was hard to find, but few complained and all made do. Music instruction and speech therapy classes were held in a storage room, hot food deliveries supplemented lunches brought from home, and students were bussed to the larger Elementary School for special events. The Maple Avenue School served the children of Kingston for many years. Over its history, as many as 132 students attended in a single year, split into four grades in the two classrooms. The school was closed several times only to be reopened to relieve overcrowding in the Elementary School or the High School. 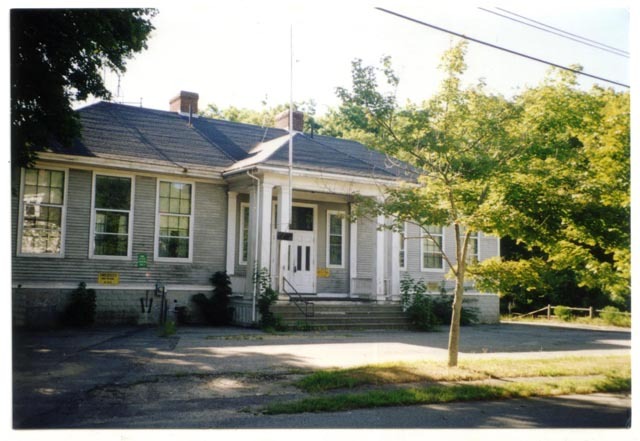 In 1974, the Maple Avenue School closed for good, replaced by the new Kingston Elementary School. The building served as overflow office space for the old Town House, housing many town departments until the completion of the new Town House in 2003. These children are posed on the steps of the Maple Avenue School around 1914 or so. 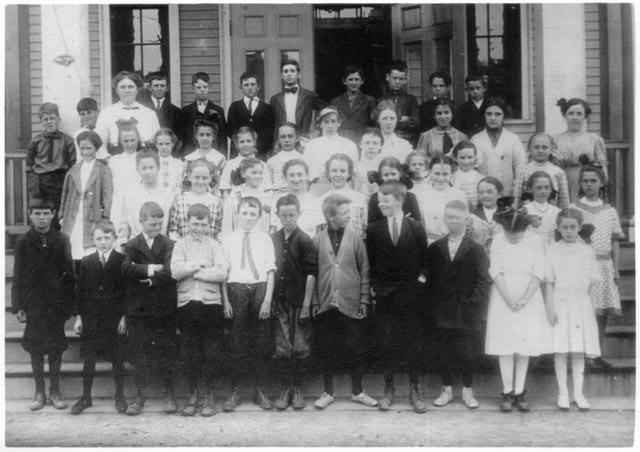 Although we don’t have an date for the photo, they appear to be fifth or sixth graders, and the second boy from the left in the front row is Russell Loring, who graduated from Kingston High School, Class of 1920. The Town Report for 1914 notes that 47 pupils attended the Center School, as Maple Avenue was known, that year; our photo shows 42. Any information about the children or their teacher might more accurately date the photo, so if you can identify someone, let us know in the comments. In 1914, schools in Kingston included the High School; three Center schools (later differentiated as Maple Avenue, Faunce and Patuxet) for grades 1-8; the Stoney Brook School for grades 1-3; the Silver Lake School for grades 1-7 and three Rocky Nook Schools for grades 1-7, including the new Cobb School in Rocky Nook which housed grades 4-7. In 1914, Kingston was just starting to move toward centralized schools rather than the more traditional neighborhood schools, although it was still common for different grades to share a classroom and a single teacher, as our photo seems to show. The students are all dressed up for their class portrait with knickers and ties for the boys and long stockings and big hair bows for the girls. Styles have certainly changed, but school still starts in September. Sources: Town of Kingston Annual Reports; Vertical Files collection. The Massachusetts Legislature of 1902 passed an act to establish Old Home Week beginning on the last Sunday in July. Events could be financed by an appropriation made by Town Meeting, and in 1903, Kingston voted $100 towards the celebration. A committee was chosen and the week’s activities planned. Guests were invited and local papers — the Old Colony Memorial and the Free Press — advertised the events. In response, letters came in from 11 states and delegates from 200 different towns attended. There was a children’s parade on Monday, with cake and ice cream following, then a May Pole dance for the more than 400 children in attendance (Kingston’s population totalled around 1900). On Tuesday, several Odd Fellows Lodges enjoyed a ball game with a banquet following. Wednesday was set aside for general exercises at the Town House, which was decorated with portraits of notable from earlier generations. Dinner was served to about 500 people and speeches followed. Thursday featured a clambake at Rocky Nook with games and competitions for entertainment. The celebration closed on Friday with an Old Home Week Dance featuring George H. Clarke’s band. The week’s festivities cost $147.84, and the efforts of many made it a smashing success.